Gary Johnson is polling below the required threshold to earn a spot on the presidential debate stage with the major party presidential candidates, Hillary Clinton and Donald Trump. But most voters think he should be there anyway. A new survey by Morning Consult found that 52 percent of voters think the former New Mexico governor and Libertarian nominee should join the Democratic and Republican candidates when they are scheduled to appear together for the first time on Sept. 26. 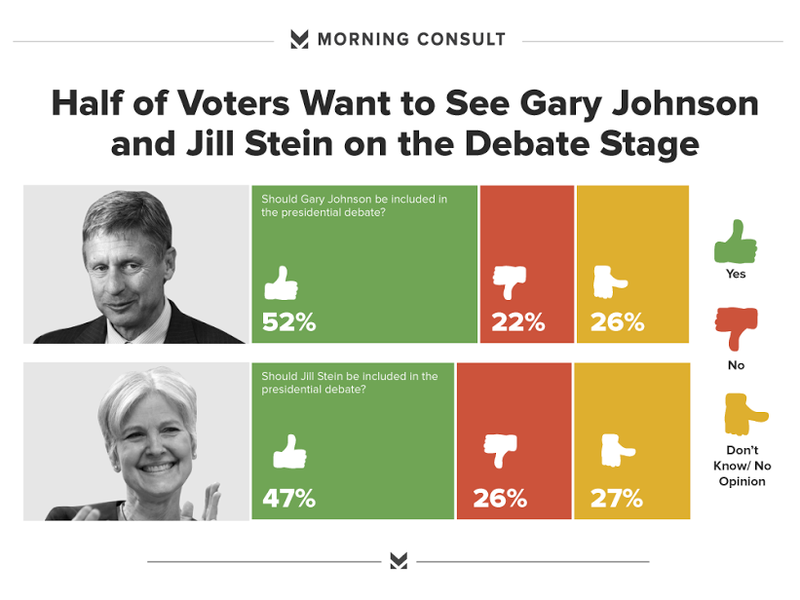 When asked about Green Party candidate Jill Stein, who has consistently polled lower than Johnson in Morning Consult surveys, 47 percent of voters said she, too, should be allowed to participate. To get on stage, the Commission on Presidential Debates has said a candidate has to be constitutionally eligible, able to show evidence of ballot access, and garner 15 percent of the average of five selected national polls. The highest level that Johnson has polled in Morning Consult’s surveys is 13 percent. He was at 8 percent in the most recent poll. This year, the commission is relying on surveys conducted by ABC-Washington Post, CBS-New York Times, CNN-Opinion Research Corporation, Fox News, and NBC-Wall Street Journal. Neither Johnson nor Stein have polled well enough to reach the stage. Not since 1992 has a third-party presidential candidate been allowed on the debate stage. That year, businessman Ross Perot, an independent candidate, joined Republican President George H.W. Bush and his Democratic challenger, then-Arkansas Gov. Bill Clinton, for the three debates. By the end of the race, Perot secured nearly 19 percent of the popular vote but not a single electoral vote, better than most other recent candidates independent of the major parties typically perform. Clinton won the election with just 43 percent of the vote. As for the importance of the first debate, voters are split. One-fourth of voters said they think the presidential debate will be “very important” when determining how they vote in November, while two out of 10 voters said it would not be important at all. Only 18 percent thought the vice presidential debate between Sen. Tim Kaine (D-Va.) and Gov. Mike Pence (R-Ind.) would impact their vote. Four out of 10 voters believe Clinton will win the debate, compared with 31 percent who think Trump will be the victor. Almost one-third of respondents (30 percent) didn’t know or had no opinion. Clinton’s supporters are more confident in her chances than Trump supporters are of his; 84 percent of people who say they will vote for Clinton think she will win the debate, compared with 69 percent of Trump supporters who think he’ll be the winner. Two-thirds of voters said they are likely to watch the first debate between Clinton and Trump, and 58 percent said they would watch the vice presidential debate. The national Morning Consult survey polled 2,002 registered voters from Aug. 29-30 for a margin of error plus or minus 2 percentage points. See the toplines and crosstabs.